Rising temperatures are risking the health of hundreds of thousands of Californians who do strenuous work indoors. We used sensors to measure how hot it gets for 16 people on the job in Sacramento, the Inland Empire and Los Angeles. The results showed that conditions were often dangerous. Workers don’t report heat illness to employers or seek medical care out of fear of not getting scheduled or losing their jobs altogether. Jose Rodriguez strides to his car near the Los Angeles-Long Beach harbor complex at the end of his shift. Over the last 26 years unloading goods for companies like Amazon and Sears, the money’s gotten a little better. But some days the only good thing about his job is leaving it. Rodriguez, who is 68, spends most of his day inside a 40-foot-long metal can, a newly arrived shipping container at the logistics company California Cartage. For $16 an hour, he pulls merchandise out onto wooden pallets, rearranging consumer goods like table saws and radios before they continue their journey to retailers nationwide. Inside that metal can, when Rodriguez is wet with sweat, it literally sizzles. Excessive heat is already a health risk for millions of Californians at work, and it’s only getting worse. Over the last 30 years, warming nights and longer heat waves have become more frequent in the state. Four of the last five years were the hottest on record; 2018 could soon make it five out of six. This July and August, in Southern California, several daily and overnight temperature records toppled. One day this summer, the temperature hit 98 degrees at the coast. As Rodriguez worked inside containers, a sensor measuring temperature and humidity found that the heat index – what it felt like to his body – was 115 degrees. When it’s that hot, he can’t think straight; he loses track of how many boxes he’s moved, and he has to start counting over. Sometimes he gets chills, and his knees give out. “The deal is that you don’t mind those things,” he said. And it could be worse. At least he doesn’t vomit, like some of his coworkers. 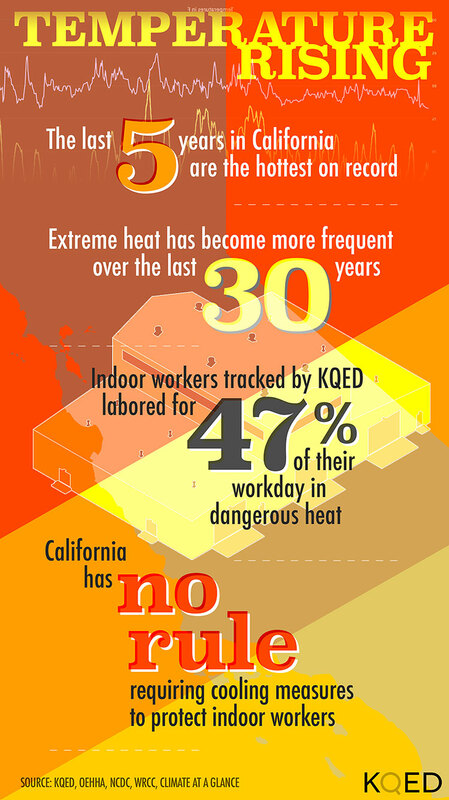 This summer, KQED investigated heat-related health hazards in workplaces where temperatures indoors can be dangerous. We gave sensors measuring temperature and humidity to 16 workers in seven workplaces, mostly in the Inland Empire and Los Angeles area, and some in Woodland, near Sacramento. The most vulnerable workers labor in industrial kitchens and laundries, and in the types of workplaces where we placed sensors: warehouses and port terminals, car washes and garment factories, a cannery and an airport. Under the state’s current proposal, employers must step up efforts to cut heat-related health risks in several circumstances, including when conditions rise above a heat index of 90 degrees. Using our sensor data, we calculated the heat index each worker felt during short periods in July, August and September. The workers we tracked experienced a heat index above the state’s proposed threshold on average 47 percent of the time. On the job, a worker’s core temperature rises when he exerts himself and when his environment is warm. Heat exhaustion – including nausea, headaches, confusion and muscle cramps – results when a person can’t cool off. When a body loses the ability to control core temperature, the more dangerous condition of heat stroke can send someone to the hospital. Workers we tracked experienced a heat index above the state’s proposed threshold on average 47 percent of the time. In 2011, that’s what happened to Domingo Blancas, over the course of several hundred-degree August days. Heat illness is generally underreported. But Blancas told his employer, saw a doctor and was hospitalized, which, along with a complaint, prompted a Cal/OSHA investigation. Employers have a general duty under state and federal law to protect workers against illness and injury on the job. The Blancas case established for the first time that in California, this duty includes heat, indoors as well as outdoors. Blancas’ employers — a warehouse and a staffing agency — each paid an $18,000 penalty for failing to minimize heat risk. California was the first state in the country to set a threshold at which employers must protect workers outdoors. In 2016, state law added a similar requirement for employees indoors, requiring Cal/OSHA to send language to the state’s Occupational Safety and Health Standards Board by January 2019. “This will probably be one of the most comprehensive safety standards to protect workers against heat,” said UCSF’s Dr. Robert Harrison, who formerly sat on the state’s Occupational Safety and Health Standards Board. Trade groups representing employers assert that the standard isn’t necessary, and criticize Cal/OSHA’s approach in crafting a rule that apply to every company. The California Chamber of Commerce, backed by management groups, is leading the opposition to the new standard, and objected to the law that enacted the requirement in the first place. Marti Fisher, a policy advocate for the group, while not commenting directly on the most recent draft proposal, says the state’s approach is overbroad, and its rule is potentially difficult for small employers to follow. “If they insist on having a one-size-fits-all, it has to fit all,” she said. Cal/OSHA’s draft standard includes what’s called a “hierarchy of controls,” actions employers must take to reduce heat or a worker’s exposure to it. Top priority in the state’s standard is to prevent heat, through ventilation and air conditioning. If that’s not feasible, employers can alter workers’ shifts to times when it’s cooler, or add breaks when it’s hot. Only if those measures don’t work can employers offer cooling vests and other personal protective gear. Just as wind chill can make a temperature feel colder to the body, humidity can make a temperature feel hotter. 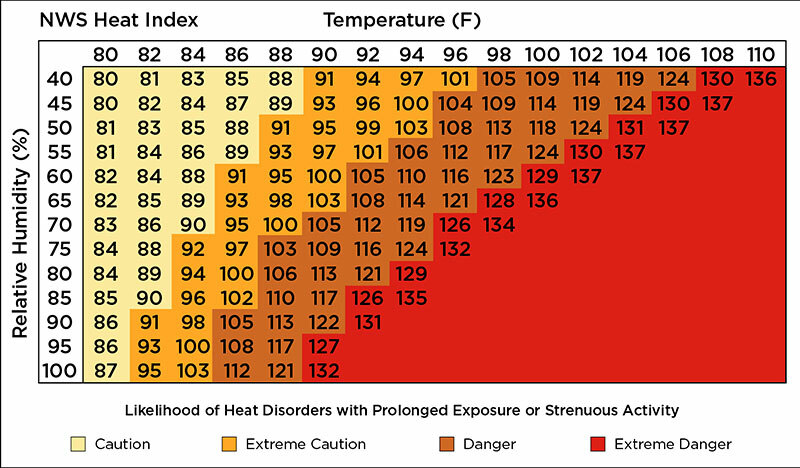 In this National Weather Service chart, you can see how humidity makes heat harder for the body to handle. At California Cartage, near the ports of Los Angeles and Long Beach, D’Wayne Wilson, 25, drives a forklift and moves goods between containers. Once, he got sick from the heat, just after he started with the company. Last spring, he saw a co-worker go down: One moment, the guy was fine; the next, he was on the floor, unconscious. Even where workers are represented by a union, rising heat is aggravating tensions around workplace conditions. This summer, 54-year-old Marta Lopez worked on a canning line at Pacific Coast Producers in Woodland, a job she's done every year since 2002. The sensor she carried measured a heat index above 90 degrees 51 percent of the time. Food hygiene rules prohibit water bottles on the line. But, Lopez says, the water coolers are on a different level, and because workers feel pressure to keep the line moving, they have to keep running up and down stairs. That makes them vulnerable to heat illness. “It’s a vicious circle that does not stop, because the heat is very strong,” she says. Mona Shulman, general counsel for Pacific Coast Producers, says that water shouldn’t be more than 30 feet from the canning line, and that no worker should have to run for a break. “Having heard that, we will be reviewing that before we start processing again, next summer, for sure,” she said. Teamsters Local 601, which represents about 6,500 workers at agricultural processing jobs including those at the Woodland cannery, has filed a heat-related grievance, says Ashley Alvarado, the local’s president. PCP says no workers in Woodland reported heat illness this year. Shulman adds the company has recognized rising heat as a health hazard since 2006, when a major heat wave killed hundreds in California, many in the landlocked Central Valley. Alvarado is skeptical. She says to ensure worker safety, a specific heat standard is necessary. “That company is going to do what they need to do when there is a law that requires them to do it,” she said. 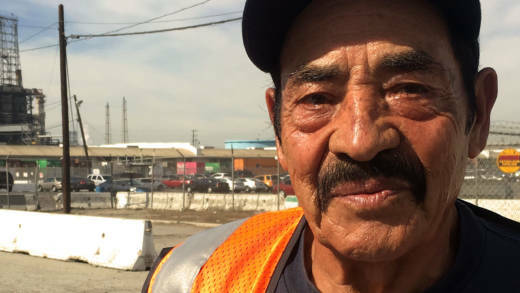 In the Inland Empire, warehouse workers are primarily Latino, low-paid, often temporary, and unlikely to have health care through their employer. For workers who told us they fear retaliation from their employers, we’re using pseudonyms. “Hugo,” who is 32, moves boxes in a warehouse for a logistics company in the Inland Empire. He says he knows that rest breaks and drinking water can prevent heat illness, but he’s under pressure to make quota. Heat illness is preventable on the job with sufficient water, rest, and shade. Since 2011, Cal/OSHA’s campaign, 99 Calor, has communicated about outdoor worker heat risk in English, Spanish, Mixteco, Hmong and Punjabi. The state also works with UCLA and UC Berkeley, whose labor and occupational health programs offer training on heat illness prevention for small businesses and workers’ groups. Warehouse workers also say they’re worried about their health because they know the climate is warming. Brandon drives a forklift in a warehouse. Lately, he says, he has felt heat symptoms twice a week. He doesn’t have health insurance, and he has only been to see a doctor once, because he pays $25 a visit. “Rebecca,” 40 and a married mother of two, experienced extreme heat more than any other worker we tracked. In July and August, her heat index on the job was higher than 90 degrees over 82 percent of the time. For more than a year, at a distribution center owned by fast-fashion retailer Charlotte Russe in San Bernardino County, she unpacked the clothes from boxes, hung them, and moved metal rods laden with merchandise. 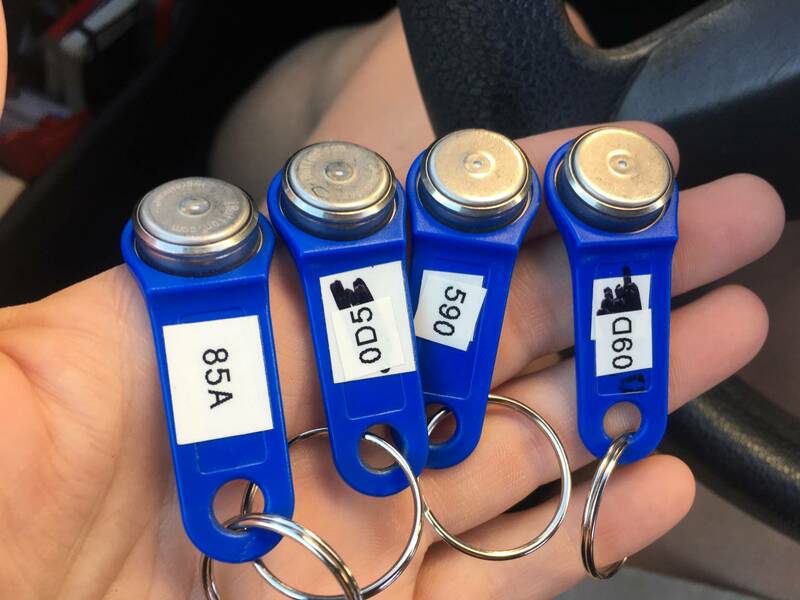 Rebecca said workers are “caged inside racks of clothes, so there is zero air getting to us.” To cool down, she and her co-workers tried using cardboard to fan each other, buying small battery-powered fans, and wrapping their heads and necks in damp cloth. She got severely sick from the heat this summer, causing her to nearly faint on a day we were tracking the heat in her workplace. That night, the index in the loft of the distribution center was 94 degrees, even after 10 p.m.
“I felt that my stomach needed to throw up; then I noticed that my hands were starting to shake,” Rebecca said. Her supervisor offered her a break but no medical care. She drove herself to a clinic, where a doctor told her she was dehydrated but wouldn’t provide documentation that conditions on the job contributed to the problem. Charlotte Russe did not return email and phonecall requests for comment. When Rebecca left work. she received no sick pay and was kept off the schedule for two days afterward. That week, after paying the doctor, she ending up losing money. Since then, she has found another job. But she still gets headaches when it’s hot. 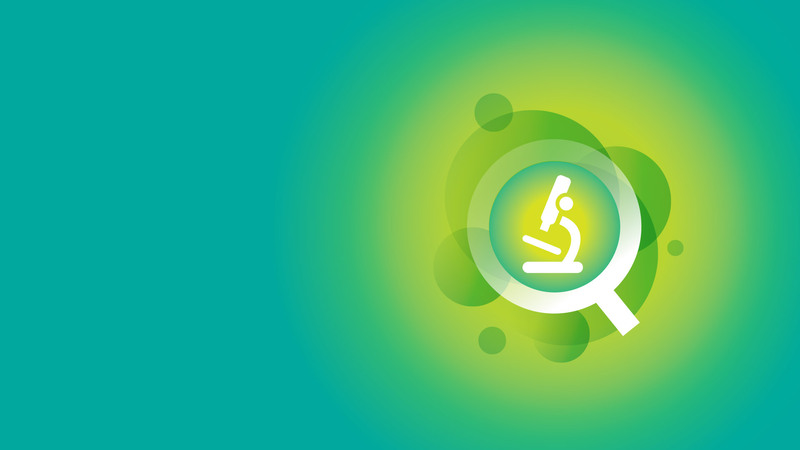 This reporting was supported by a grant from the USC Annenberg Center for Health Journalism Impact Fund.